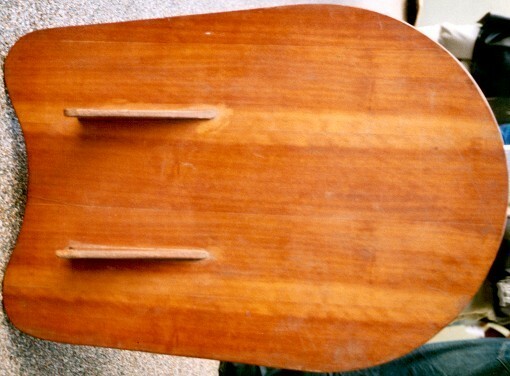 1960 Paipo/Belly Board 2 ft 8"
Five ply. Paint. Varnished. Adhesive stickers. Note unusual placement towards the centre of the board. Skull and crossbones graphic with text, Speed King. Water soaked, Probably added during manufacture. Black Foot grahic with text, Barefoot. Paper/vinyl, probably post production. Deck: Red racing stripes, right hand side. Note parrallel to rails, not centre. Catalogue No. 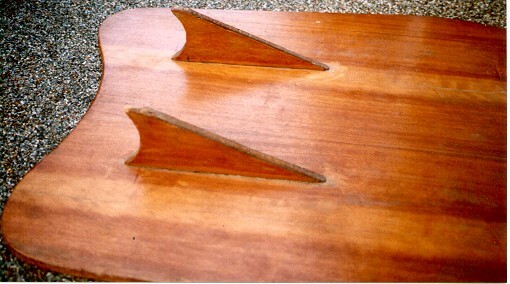 191 : " PAIPO BOARD no name, 3' neat 1960's plywood single fin, good condition." 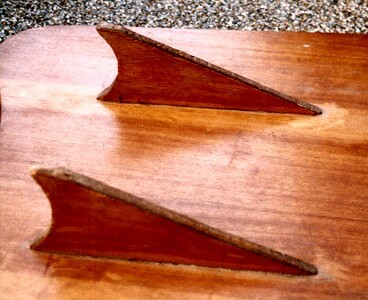 Concave tail and Fins detail.